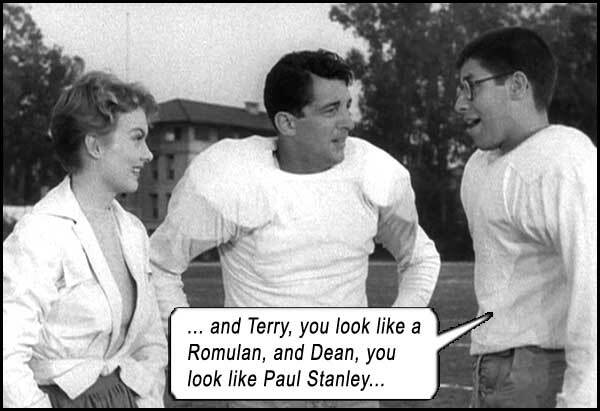 Following in the wake of their soporific debut (AT WAR WITH THE ARMY, Jan 1951), Dean Martin and Jerry Lewis prove themselves a formidable film comedy duo in THAT’S MY BOY, an original film written for them, which showcases their talents as actors and comedians. Junior Jackson (Lewis) is the sickly son of legendary baller and wealthy he-man, Jarring Jack Jackson (Eddie Mayehoff). Jarring Jack is agog at his son’s constant ailments, wondering aloud to his wife whether Junior is their son. While Jarring Jack wants his son to follow in his footsteps at his old college and take up the manly game of football, to his chagrin, bean-stem Junior would rather go into animal husbandry… Bill Baker (Martin) is the handsome jock son to a poor, sunken-chested father. Jarring Jack enviously wonders aloud why Bill isn’t his son. As a favor to his old school’s coach, Jarring Jack agrees to fund the talented Bill through college, on one condition – that Coach also put Jack’s own unqualified son, Junior, on the football team. Jarring Jack then tells Bill he has a free ride through college – as long as he shepherds Junior through the football team. It’s actually a very dark plot when you think about it (which none of us did when we were kids enjoying the antics of Lewis and Martin), starting with extortion and ending with a father’s forceful wishes being met, rather than a son finding his own way. The same director who had little clue on how to utilize Martin and Lewis in AT WAR, Hal Walker, works from a script by Cy Howard (who wrote MY FRIEND IRMA, Martin and Lewis’s first onscreen performance), and proves he has learned how to hone the performances of Dean and Jerry to their utmost potential. Though the threat of scenery-chewing is always hanging over the characters like a Damoclean sword, nobody overplays their parts. Eddie Mayehoff’s alpha male Jarring Jack is excellent, bordering on caricature with his clipped syllables and flamboyant presence, yet able to accept his shortcomings when advised by a psychiatrist friend. It takes more than one viewing to appreciate the nuance. The same can be said about Jerry’s performance; with his buzzcut and a lesser version of his “nine-year-old” voice, we expect this to be a slapstick touchdown. Far from it. 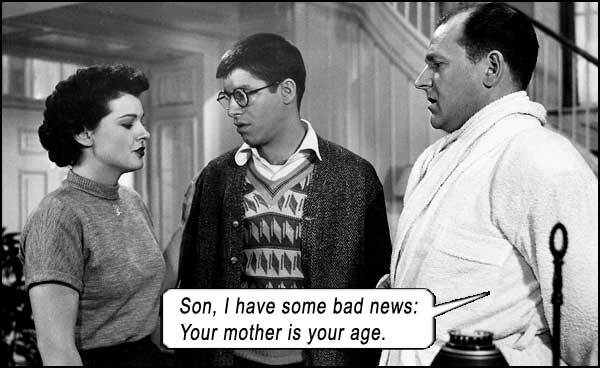 Yes, he wears Coke-bottle glasses, teeth braces, has allergies all year round, takes nose drops, crushes pills to swallow them, etc., and there are the many instances he walks into doorjambs, but he imbues Junior with a real pathos in the shadow of his dominant father. He’s almost a straight man, he keeps it so temperate. Dean, as usual, plays the “strapping, healthy good-looking specimen” but never to the point of meanness, as he did in AT WAR. We witness his vaunted “straight man” talent at every turn, and there are even parts of the film where we feel that in real life, Dean and Jerry are becoming closer. In fact, their decade-long film career did reflect their partnership offscreen. Dean’s Bill actually shows compassion and loyalty, by threatening to leave the team if Junior is dropped. This is also the film where Dean and Jerry do the classic “Makes no difference to me” callbacks. Junior tells Bill from a lower bunk, “I hope we’ll become friends and like rooming together; you know, roommates, pals…” It seems that in film, all Jerry’s and Dean’s characters reflected their real life feelings, Jerry always confessing in interviews how much he loved Dean, even though Dean couldn’t have cared less for Jerry’s friendship. Having left Polly Bergen at home (after a song and dance number), Bill’s college love interest is rambunctious Marion Marshall, thin as sin with an A-cup pointy bra. At first, Bill says, “Three things stop a guy playing football: bein’ with a dame, goin’ with a dame and likin’ a dame.” Or maybe some SJW punching him in the face for calling a woman a dame. After embarrassing his father by scoring a touchdown for the other team, Junior trains and becomes a good footballer, winning the big game – which sends a distinctly positive message to bullying fathers. In an early scene where Junior wants to take Polly Bergen home from a prom, he ends up doing just that – driving her home while she snuggles in the backseat with Bill. What guy hasn’t experienced some form of emasculation like this? Well, by the end of the movie, Junior has once again been emasculated, but in a more insidious way – following in his father’s footsteps against his will. It’s meant to be a happy ending where Junior reconciles with Jarring Jack, but it is, in fact, an admission that “animal husbandry” is kinda gay, that being a hypochondriac is effeminate and choosing a life other than football makes you less of a man. Like maybe, a dame. Starring: Dean Martin, Jerry Lewis, Ruth Hussey, Eddie Mayehoff, Marion Marshall, Polly Bergen, Hugh Sanders, John McIntire.